Web Summit, originally Dublin Web Summit, is a technology conference held annually since 2009. Taking place in Lisbon since 2015, Web Summit has grown to become on of the largest technology conferences in the world. The event brings together 60,000 attendees from over 160 countries. This includes CEOs and founders of over 2000 tech start ups as well as 1400 investors. Over 2,600 media from more than 100 markets came to Web Summit were present in 2017. It’s not just editors from many of the world’s most influential publications, but market-shaping industry reporters from leading technology and trade publications and blogs. 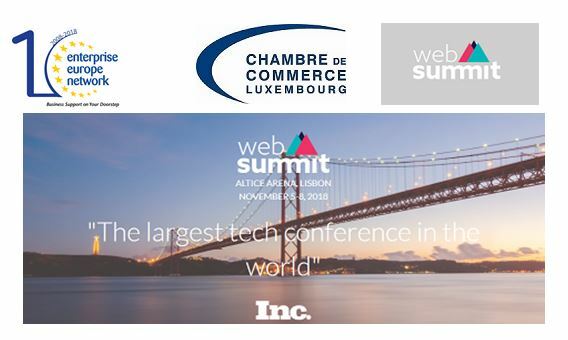 The Luxembourg Chamber of Commerce in collaboration with EEN Luxembourg is organising an accompanied visit to Web Summit.